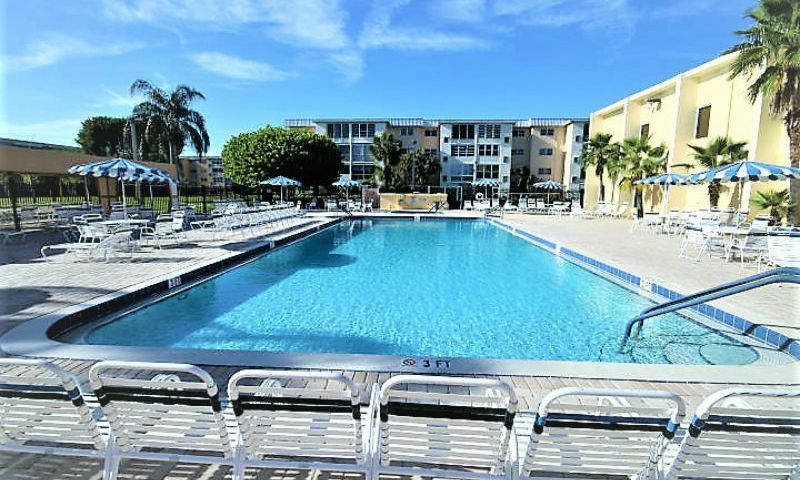 Village Royale on the Green is a 55+ condo community located in Boynton Beach, Florida. There are 880 condo units that range in size from 758 to 982 square feet with one or two bedrooms, two bathrooms, and assigned parking spots. Residents have access to two luxuriously appointed clubhouses with an exercise room, card room, library, and the VRG Entertainment Center - a large theater used for performances, holiday gatherings, and other community events. Outdoors, residents can soak in the Florida sunshine with an outdoor pool and patio, shuffleboard and bocce courts, an on-site driving range, and walking paths throughout the community. Village Royale on the Green is ideally situated in Boynton Beach near daily shopping stops and major roadways and also have plenty of golf courses and beautiful beaches within a short drive. Check back soon for more information on the lifestyle in Village Royale on the Green. Great community close to beaches, inlet for boating, great restaurants, shopping and affordability! 55places.com is not affiliated with the developer(s) or homeowners association of Village Royale on the Green. The information you submit is distributed to a 55places.com Partner Agent, who is a licensed real estate agent. The information regarding Village Royale on the Green has not been verified or approved by the developer or homeowners association. Please verify all information prior to purchasing. 55places.com is not responsible for any errors regarding the information displayed on this website.